On April 24, 2018, a demolition request was filed for the old Kozeneski farm house at 173 Linebrook Rd. The Kozeneski home is an rare local example of a late 19th or early 20th Century, single-family farm house in its original pastoral setting. The Ipswich Patriot Properties site lists the date of construction as approximately 1900. Members of the Historical Commission toured the building recently but did not find indications of earlier construction. A house is shown on the 1872 Ipswich map at 173 Linebrook Road in Ipswich, owned by “J. H. Wiley.” In the 1910 Ipswich map the property is owned by the “heirs of A. Lummos” but it does not display a house or buildings. In 2018 plans have been submitted to turn the 56 acre Kozeneski farm into a new housing development. Inside the barn at the Kozeneski property on Linebrook Rd. 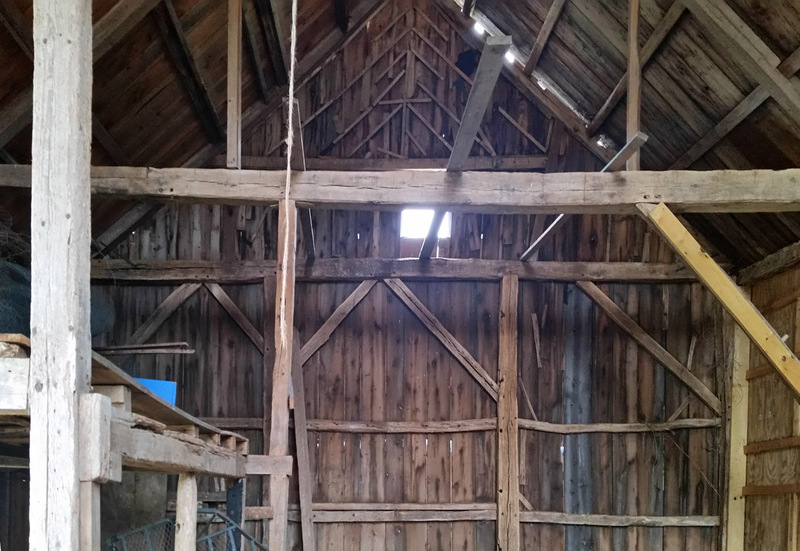 The roof is a master rafter-common purlin construction, which is unique to eastern New England. The barn may be older than the house. In the first half of the 19th Century, this property belonged to Abram Lummus, son of Abraham, and the property across the street belonged to William Lummus. In the 19th Century both Lummus properties were owned by the Kozeneski family. Gavin Keenan wrote, ” Kozeneski’s was one of a number of working farms occupying the land between Linebrook Road and High Street. Fertile and irrigated by both Dow and Bull Brooks, this land has been tended by generations of Marini, Galicki, Kozeneski, Wegzyn and Barowy families, busily producing meat, poultry and produce to this day.” Read Last Roundup at the Lazy K-Ranch.